With our PKI 2595, you bring data long believed to be deleted back to light. Mobile phones have long been used not only for phoning or texting. Organizer with calendar, e-mail functions, photos and videos, mobile internet and a lot more is realised with the latest smartphones today. Who now believes that data, such as contacts, SMS, call lists, e-mail, etc., are really deleted upon their deletion is again mistaken. For design reasons, the internal memory is not deleted completely. Owing to speed, energy efficiency and some other parameters, it is only suggested to have deleted the relevant information. It is thus possible without further ado to reconstruct the last messages (several hundreds, if available) of a reasonably up-to-date mobile phone with SMS functions using our PKI 2595. Deleted call lists can also be recovered even after some months. Depending on the type, currently more than 3000 different ones, the most varied information can be gathered from the target phone by simply connecting our PKI 2595 via the corresponding cable. 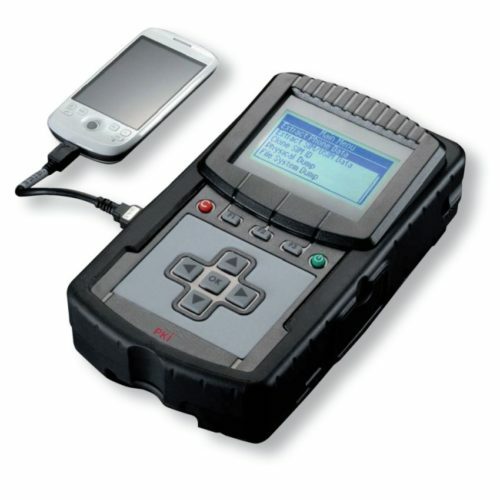 Upon connection, the PKI 2595 identifies the corresponding telephone type, extracts the existing information from the device and makes it available to the operator in readable form. Data export via a USB interface is of course possible, too. The copy function allows to copy a mobile phone completely or only partially. This way, GSM clones can be produced. incl. software update up to one year in case of type updating with new phones.